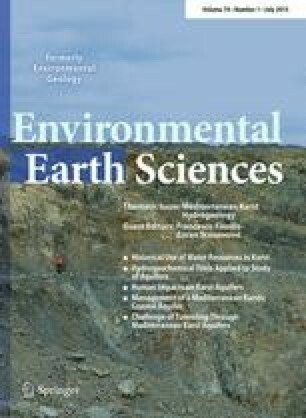 This paper presents the results of a geochemical and isotopic study of technogenic soils and acid pool waters in the abandoned mine tailings pile and its potential impact on the adjacent farmers’ wells at the village of Serwis (south-central Poland). The acid tailings pools showed strong trace element and REE signals. These acid pools were featured by the predominance of medium rare earth elements (MREE) with a strong positive Gd anomaly. The technogenic soils also revealed a MREE roof-shaped pattern, but with distinct positive excursions in Gd, Sm, Eu and Ce. The δ34S-SO4 2– signatures of acid pool waters (mean of 1.3 ‰) were close to those of soils and pyrite (means of 2.3 and 3.2 ‰, respectively). The waters of four farmers’ wells exhibited nearly the same δ34S-SO 4 2– values (0.7–4.0 ‰) as the nearby acid pool waters (0.3–3.1 ‰). The similar δ34S isotope signatures combined with the highest contents of dissolved SO4 2– (181–577 mg/L) in these wells suggest that the tailings pile is a potential source of SO4 2– derived from pyrite weathering. This relationship may also be evidenced by a spatial (site) variable dendrogram that groups these four wells into one cluster at the linkage distance (D link/D max × 100) < 53. Mining has historically had a detrimental impact on the environment. The historic mining areas occupied by tailings impoundments, waste rock piles, mineral settling tanks, mine pit lakes and ponds or unprotected abandoned mine workings jeopardize the health of various abiotic and biotic systems (e.g. Hudson et al. 1997; Durn et al. 1999; Teršič et al. 2009; Kierczak et al. 2013; Martínez- Martínez et al. 2013). The studies have also encompassed specific geochemical signatures that these post-mining and derelict areas have on the landscape. Many of these sites are potential sources of toxic metal(loid)s which are released to the environment because of acid mine drainage (AMD). The AMD is the most significant process, which is responsible for remobilization of trace elements from mineral deposits, mineralized rock formations, mineral ponds, mineral tailings piles and mining waste disposal sites induced primarily by anthropogenic activity (Nordstrom 2011). This is triggered by oxidation of pyrite (FeS2) and to a lesser extent of other iron-bearing sulfides in the presence of two natural oxidants, i.e. oxygen and even more effective ferric (Fe3+) iron (e.g. Garrels and Thompson 1960; Moses et al. 1987; Nordstrom and Alpers 1999). These reactions bring about a considerable decrease in the pH and an increase in concentrations of ferrous (Fe2+) and sulfate (SO4 2–) ions in water. The typical pH of AMD waters is below five, but mostly in the range of 1–3. The process of pyrite oxidation is often expedited by human activity, i.e. mining, mineral processing and construction works (e.g. Knöller et al. 2004; Butler 2007; Nordstrom 2011; Szynkiewicz et al. 2011). The AMD releases toxic elements to the environment jeopardizing the quality of water, soils, plant and animal species, man, and diverse ecosystems throughout the world (e.g. Nordstrom and Alpers 1999; Simón et al. 2001; Aguilar et al. 2004). A variety of environmental studies have utilized trace metal(loid)s, rare earth elements and stable isotopes to fingerprint pollution sources and their relative strengths, as well as to pinpoint mobilization, transport and deposition of different toxic elements (e.g. Hudson et al. 1997; Verplanck et al. 2004; Merten et al. 2004, 2007; Malmström et al. 2006). Numerous case studies conducted in the AMD areas have made use of determinations of S and O isotopes to solve crucial environmental issues (e.g. Butler 2007; Tichomirowa et al. 2010; Miao et al. 2013). The study area covers an abandoned low-grade ore tailings pile and nearby farmer’s wells located at the village of Serwis (Holy Cross Mountains, south-central Poland) (Fig. 1). Because these tailings were derived from the currently inoperative pyrite-uranium mine, the wells may be at risk for contamination with uranium and other toxic elements. A couple of unlined acid pools that occur inside this mine tailings site are a source of sulfuric acid and trace elements that may be carried in runoff or leachate. The principal objectives of the present study were as follows: (1) to determine mean and observed range concentrations of uranium and other potentially toxic trace metal(loid)s in technogenic soils (spolic technosols), and acid pool and farmers’ well waters and (2) to use trace elements and stable S and O isotopes as possible geochemical and isotopic signatures that could assess the impact of the reclaimed tailings pile on the selected neighboring farmer’s wells. In addition, the results of isotopic analysis were to elucidate the pathways by which pyrite oxidation products brought about acidification of pool waters. The use of both element and isotope determinations enabled us to better understand the source, transport and fate of these elements, but especially their speciation in the acidic to circumneutral environment. The reclaimed former mine tailings pile of low-grade iron ore at the village of Serwis occupied a flat area (alt. 248–257 m a.s.l.) of about 800 × 120 m (~9.6 ha). The part of this site was transformed into meadows, so the current area is approx. 580 × 120 m (~7 ha). This wasteland is located approximately 1.6 km south–west of the inoperative “Staszic” pyrite-uranium mine at Rudki. The localization of the study area with sampling points is presented in Fig. 1. Physiographically, the study area lies in the northern part of the Dębno Valley that separates the Łysogóry range in the south and the western part of the Pokrzywiański range in the north. The bedrock of the Dębno Valley is built of Ordovician and Silurian clayey shales, siltstones and graywackes. In contrast, the towering Łysogóry range consists primarily of middle/upper Cambrian quartzites and quartzitic siltstones and sandstones with clayey shale interbeds whereas the Pokrzywiański range is composed of lower and middle Devonian quartzitic sandstones and siltstones, and dolomites, with subordinate limestone, clayey shale and tuff interbeds (Fig. 2). No sedimentary sulfate minerals (gypsum, anhydrite) occur in these rock formations (Czarnocki 1956). In general, bedrock lithology is in conformity with geomorphology, which means that hard rocks (quartzites and dolomites) build heights whereas soft rocks (clayey shales) form depressions. In places, these two ranges are laterally faulted. The most distinctive is the deep-rooted Łysogóry fault that extends nearly north–south through the small town of Rudki. This fault hosts a pyrite-hematite-siderite-uranium mineral deposit. Most of the study area is blanketed by glacial tills, fluvioglacial gravels, sands and silts, in places by loesses that form ravines reaching a few meters deep. The calcite-rich loesses impart a higher pH (above 7) to local underground waters. In wells W3 through W8 the water table occurs at a depth of about 5 m below the ground whereas in wells W1 and W2 at a depth of about 10.0 and 15.5 m, respectively. These wells are recharged from shallow perched aquifers that occur within glacial and postglacial deposits. The main Silurian-Lower Devonian and middle-upper Devonian aquifers are situated much deeper (at least 150 m below the ground) as indicated by the geologic-mining reports from the Rudki area (Prażak 2012). The local perched Quaternary aquifers are fed by precipitation (rainfall and snowmelt). In general, the shallow underground flow is penacordant with a descent of the land, i.e. toward the southeast and partly northeast (Fig. 1). This results in seasonal fluctuations of water tables and temperatures. The yield of the farmer’s wells is low averaging 0.1 m3/h. Localization of abandoned mine tailings pile above these aquifers may jeopardize the quality of underground water. The Rudki area is one of the most interesting historical metal-ore mining sites in Europe. Originally, hematite (γ-Fe2O3) of Rudki found useful applications in the Neolithic for body, weaponry, pottery and product coloring as a mineral dye. During the Roman period, but especially from the 1st through 4th century, the hematite ore was mined for smelting of pig iron in numerous primitive furnaces. This mineral deposit was re-discovered in 1922 by a geologist Jan Samsonowicz (Samsonowicz 1923), and extraction of iron ores, i.e. hematite and deeper occurring siderite (FeCO3), was resumed in the twenties of the 20th century. During 1933–1969, pyrite and marcasite (FeS2) were mined from a depth of at least 450 m for production of sulfuric acid (Jaskólski et al. 1953; Czarnocki 1956). In 1952 uranium mineralization was found and pitchblende (partly altered uraninite UO2) ore was mined until 1968 (Szecówka 1987; Zdulski 2000). During 50 years of mining operation, over 0.5 million metric tons of pyrite/marcasite- and siderite-bearing mine waste material was stockpiled on about 9.5 ha of land adjacent to the village of Serwis. The principal phase of reclamation was conducted during 1972–1973. After disaggregating of rock lumps, the acidic waste was neutralized with unslaked lime (100 tons/ha) and subsequently by a ground phosphate rock (3 tons/ha) (Skawina et al. 1974). This site was then investigated in 2005 and the field study encompassed soil sampling of five pits dug to a depth of 40–125 cm (Warda 2007). The results of this study indicated that the reclamation was unsuccessful. This was also evidenced by a sparsely vegetated habitat that comprised dwarfed birch trees, bushes, grasses and mosses separated by unvegetated muddy patches. The concentrations of selected trace metals in these soils were as follows: Cd (0.25–4.55 mg/kg), Cr (12.7–36.9 mg/kg), Cu (19.0–39.5 mg/kg), Ni (19.0–69.5 mg/kg), Pb (14.0–105.5 mg/kg), and Zn (52.4–166.6 mg/kg). Based on these results, Warda (2007) concluded that the element concentrations did not jeopardize the neighboring environment. Fieldwork was conducted on June 1 and November 9 of 2013. This included soil and water sampling. During the first field series 27 soil samples were collected based on a 3 transect approach (Fig. 1). This enabled us to take the most representative samples for a rectangular study area (OSWER Directive 1995). Locations of sampling points were determined using a global positioning system with a precision of ±4 to 5 m. At each of the 27 sites (S1 through S27), pits were dug to a depth of about 0.4–0.5 m. Each composite soil sample (weighing about 2 kg each) consisted of 5–10 subsamples. The soil samples were placed in polyethylene bags for REE and other trace element determinations. Of the 27 soil samples, 6 were chosen for isotopic analysis. In addition, 2 water samples (P1/1 and P1/2) were collected from the acid pools for preliminary element determinations. During the November sampling series four acid pool and eight farmer’s well water samples (P2/1 though P2/4 and W1 though W8) were collected for both chemical and isotopic analysis. The sampling plan also encompassed collection of eight pyrite-bearing dolomite samples for stable sulfur isotope determinations. All the water samples for trace element measurements were filtered through 0.45 µm pore-sized PTFE syringe filters and placed in 50 mL polypropylene vials. In addition, the water samples for stable S and O isotope determinations were placed in 10 L polyethylene containers. The filtered water samples were transported to the Geochemical Laboratory of the Institute of Chemistry, Jan Kochanowski University in Kielce and stored in a refrigerator at a temperature of about 4–6 °C. The chemical analysis was performed on the following day. Fieldwork also included direct measurements of pH, electric conductivity (EC) and temperature (T) of water, using a manual pH-meter GPX-105 s and a manual EC-meter CC-101 equipped with temperature sensors (Elmetron, Poland). In addition, alkalinity and concentrations of SO4 2– were determined on-site using a field spectrophotometer LF-205 Slandi, Poland. During sample collection, transport, storage and preparation, procedures were followed to minimize the possibility of contamination. A set of water samples included one blank (deionized water from the laboratory that was processed in the field along with the environmental samples) and one replicate sample for each sampling series. As mentioned before, the water samples were filtered through 0.45 µm pore-sized PTFE syringe filters on-site whereas the soil samples after removal of miscellaneous material (leaves, twigs, etc.) were dried at an ambient temperature of about 20 °C and then disaggregated to pass a <0.063 mm sieve using a Pulverisette 2 Fritsch’s blender and then Analysette 3 Spartan shaker. Each soil sample (0.5 g) was digested with aqua regia (6 mL HCl + 2 mL HNO3) in a closed microwave system (Multiwave 3000; power 1000 W, time 65 min., T 220 °C, p 60 bars, p growth rate 0.3 bar/s), replenished up to 25 mL, evaporated (160 °C), and the insoluble residue was filtered. For the purpose of this study all the water samples were analyzed for 14 trace elements (Ag, As, Ba, Bi, Cd, Co, Cr, Cu, Fe, Mn, Ni, Pb, U, Zn) and 14 REE (La through Lu), Y, Sc, and the soil samples additionally for Sb and Ti using an ICP-MS instrument (model ELAN DRC II, Perkin Elmer). Instrumental and data acquisition parameters of the ICP-MS instrument were as follows: sweeps/reading, 20; readings/replicate, 3; replicates, 4; nebulizer gas flow, 1.03 L/min, plasma gas flow, 15 L/min; lens voltage, 7.50 V; and plasma power, 1275 W. The measurements were done in the peak hopping mode and the dwell time was 50–150 μs depending on the analyte. Two internal standards were utilized: Rh and Ir. Correction equations for Nd, Sm, Gd, Dy, and Yb were used for elimination of interferences. The ICP-MS instrument was optimized with a standard daily procedure. For REE determination a series of Multielement Calibration Standard 2 Perkin Elmer solutions and for trace element determination a series of Multielement Calibration Standard 3 Perkin Elmer solutions were used. In addition, the homogenous soil samples were analyzed for Ca, Fe, K, S and V using a portable XRF analyzer (model Thermo Scientific NITON XL3t 960 GOLDD+). Time of XRF analysis was 120 s, measurements were done in triplicate and mode was set on “soil”. The pH of soil samples was measured on water solutions in the laboratory. About 10 grams of each sample was placed in a beaker and stirred vigorously with 25 mL of deionized water. The pH measurements were made after 24 h at a room temperature of about 20 °C. The standard reference materials (SRM) applied for measuring element concentrations by ICP-MS were: (1) NIST 1643e (trace elements in water) and the geologic multi-element reference material (GM-ERM) PPREE1 (Table 2 in Verplanck et al. 2001) for waters, and (2) Certified Reference Material (CRM) NIST 2710a (Montana I Soil) and GSS4 for soils. For comparison, the REE concentrations derived from ICP-MS measurements were normalized to North American Shale Composite (NASC) using values given by Haskin et al. (1968) and Gromet et al. (1984). For the quality control of portable XRF analysis, a CRM NIST 2709a (San Joaquin soil) was used. Quality control included both accuracy (CRM) and precision (triplicates). The average recovery of elements from the SRM and CRM was in the range of 86–120 % for waters and 83–102 % for soils (except for Ti and REE 70–80 % due to incomplete sample digestion with aqua regia), whereas the uncertainty of the method was below 10 %. The RSD values were <4 % for most of the analyzed samples. The chemical analyses of collected samples were performed in the Geochemical Laboratory of the Institute of Chemistry, Jan Kochanowski University in Kielce. The cluster analysis is a common method of multivariate analysis that allows us to form groups of related variables. Based on similarities within a class and dissimilarities between classes the objects are categorized into “clusters”. The main objective of this method is to identify homogenous and distinct groups within the data set (Maechler et al. 2012). At the beginning the data were normalized and standardized using STATISTICA Base software (StatSoft Inc.), with the linkage distances for a particular case divided by the maximal linkage distance (D link/D max). The cluster analysis was done using the Ward’s method with a 1-Pearson’s R as a measure of similarity. The preliminary sample preparation for isotope analysis was done in the Geochemical Laboratory of the Institute of Chemistry, Jan Kochanowski University in Kielce. The isotopic analysis was performed on 12 water, 6 soil and 6 pyrite samples. About 20 g of each soil sample was treated with a mixture of 90 mL 0.15 % CaCl2 + 5 mL 25 % HNO3 and then mixed up in a compact shaker IKA WERKE KS 501 digital. Dissolved SO4 2– of soil and water samples was precipitated in the form of BaSO4 by adding 10 % BaCl2 solution. Subsequently, the precipitated BaSO4 was rinsed with deionized water to remove Cl− ions (until a negative reaction with AgNO3 was obtained) and dried at a temperature of 100–110 °C. These samples were then sent to the Mass Spectrometry Laboratory of Maria Curie-Skłodowska University in Lublin to perform further preparation prior to S and O determinations. The SO2 gas for δ34S(SO4 2−) determinations was extracted from BaSO4 by reacting 10 mg aliquot with the mixture of NaPO3 and Cu2O (3:4) under vacuum at 800 °C (Hałas and Szaran 2004). The SO2 was cryogenically separated from CO2 (formed from organic impurities) in n-pentane frozen in liquid nitrogen, and from water vapor in a mixture of dry ice and acetone (Mizutani and Oana 1973; Kusakabe 2005). The CO2 for δ18O(SO4 2−) determinations was obtained by reducing BaSO4 with graphite to CO which subsequently was quantitatively converted to CO2 by glow discharge in magnetic field (Hałas et al. 2007). This is a modified method of Mizutani (1971). The pyrite crystals were separated from the dolomite matrix under the stereoscopic microscope by hand-picking. The remaining carbonate inclusions were removed by adding HCl (1:1). Sulfur isotopic composition of pyrite was measured on SO2 prepared by oxidation of pyrite by cuprous oxide (Cu2O) in vacuum at 950 °C. Both δ34S and δ18O determinations were carried out off-line on a dual inlet and triple collector isotope ratio mass spectrometer (MI-1305 model with modified inlet and detection systems) on SO2 and CO2 gases, respectively. The results were normalized to V-CDT (Vienna Cañon Diablo Troilite) and V-SMOW (Vienna Standard Mean Ocean Water), and reported as permil (‰) deviations from these standards. International standard NBS–127 with δ34S = 21.17 ‰ and δ18O = 8.73 ‰ (as determined at Maria Curie-Skłodowska University Mass Spectrometry Laboratory (Hałas et al. 2007)) was analyzed for normalization of raw delta values. The δ34S measurements were done with a precision of ±0.08 ‰, whereas δ18O with a precision of ±0.05 ‰, respectively. The overall reproducibility (\(2\sigma\)) was 0.2 ‰. In addition, 12 water samples were analyzed for stable O and H isotope ratios. The water samples were filtered and analyzed automatically along with two IAEA standards, OH-13 and OH-16, to which both delta values of the analyzed samples were normalized and expressed in ‰ relative to V-SMOW. The following delta values were accepted for the IAEA standard OH-13 δ18O = −1.28 ‰ and δD = –2.67 ‰, whereas for OH-16 standard: δ18O = –15.57 ‰ and δD = –120.67 ‰ (Choudhry et al. 2011). The analytical reproducibility (2σ) was 0.1 ‰ for O and 1 ‰ for H. The δ18O and δD values of water samples were determined on-line on the Picarro L2120-i Analyzer in the Faculty of Geosciences, Maria Curie-Skłodowska University in Lublin. All the isotope results were rounded off to one decimal place. The pH values and selected element concentrations in 27 technogenic soil samples versus the mean values derived from the previous study conducted about 1 km southeast of the present study area (Migaszewski 1997) are reported in Table 1. The pH of these soils was in the range of 2.8–7.2 (mean of 3.9) showing the lowest values within unvegetated muddy patches, especially in the northern and east-central parts of the mine tailings site. These patches also revealed the highest concentrations of S reaching 2.321 % (S15). Moreover, the examined soils showed the largest spatial variations in concentrations of most elements, especially S, Fe, Co, Mn, Ni, Pb, U and Zn. Compared to the results derived from the previous study by Uzarowicz (2011), the soils currently examined exhibited distinctly higher concentrations of As, Cd, U and V (Table 2). The differences between these values are due to a larger number of samples that covered the whole currently examined area. In contrast, the previous study encompassed only 6 samples taken from a shallow pit to a depth of about 75 cm. The mean concentrations of these four elements were higher than those in topsoils of the control site (Migaszewski 1997) and Europe (Salminen et al. 2005): As (14.2 vs. 11.6 mg/kg), Cd (1.0 vs. 0.28 mg/kg), U (7.7 vs. 2.4 mg/kg) and V (160 vs. 68 mg/kg). In different historic technosols the contents and profiles of trace elements depend on the scope of ore mining and processing, for example, slags of historical Cu smelting of Rudawy Janowickie (southwestern Poland) contained As (15–315 mg/kg), Cu (3196–134,00 mg/kg), Pb (22–738 mg/kg) and Zn (1294–9359 mg/kg) (Kierczak et al. 2013). Another example is topsoils at the historic mining area in Podljubelj (northwestern Slovenia) that showed elevated concentrations of As (8–49 mg/kg), Cd (0.3–1.5 mg/kg), U (1.6–7.8 mg/kg) and V (32–128 mg/kg) (Teršič et al. 2009). The high REE abundance exceeding 100 mg/kg was recorded in both acid and circumneutral soil samples (Table 3). The lanthanide concentrations in the Serwis technogenic soils were lower than those in topsoil of Europe averaging 125.59 mg/kg (Salminen et al. 2005). For comparison, the contents of REE in soils of mining and mineralized areas are higher, for example, metal-rich soils of South China were reported to reach 260.77 mg/kg REE (Miao et al. 2008). The selected physicochemical parameters and trace element concentrations in acid pool and farmer’s well waters are presented in Table 4. This table also contains archival data derived from the previous hydrogeochemical study performed during 2004–2006 in this part of the Świętokrzyskie province (Michalik 2012). The lowest pH values of pool waters (P2/1 through P2/4) corresponded to the highest concentrations of SO4 2− that were in the range of 2115 mg/L (P2/4) to 4470 mg/L (P2/1) (Tables 4, 5). The distinct pH differences between the waters of acid pools and farmer’s wells were also reflected by the mean concentration ratios of trace elements between these two media reaching even an enrichment factor of 1744 (Co), 550 (Mn), 506 (U) or 136 (Ni). The distinct abundance of stream and pond waters in SO4 2− and metals was noted in many AMD waters throughout the world (e.g. Nordstrom and Alpers 1999; Knöller et al. 2004; Butler 2007; Nordstrom 2011). Of the farmer’s wells examined, W3 exhibited the highest levels of SO4 2−, Co, Fe and Ni, which were reflected by the highest value of EC. It is noteworthy that wells W5, W6 and W7 also showed elevated contents of these elements (Table 4). The acid pool waters were also highlighted by distinctly higher REE concentrations in the range of 99.89 (P2/4) to 1065.50 μg/L (P1/1) with a mean of 601.92 μg/L. These corresponded to the natural standard reference water sample PPREE 1 from the Paradise Portal, San Juan Mountains, southwest Colorado, which contained 457.73 µg/L REE (Verplanck et al. 2001). The maximum REE contents were in turn similar to those noted in acid effluents of the abandoned Zn–Pb mine of Santa Lucia in western Cuba (370–860 µg/L) (Romero et al. 2010) and stream waters of a Cu–Pb–Zn mining area in the Metalliferous Hills, Italy (929 µg/L) (Protano and Riccobono 2002). However, these values were still below those (up to 8 mg/L) found in underground waters impacted by AMD in an abandoned uranium mining area of Eastern Thuringia, Germany (Merten et al. 2007). In contrast, the Serwis farmer’s well waters were distinctly impoverished in REE. The highest concentrations of REE and Y were noted in well W3. Of the measured physicochemical and chemical parameters, the contents of Fe and Mn were in most farmer’s wells close to or even above allowable limits for drinking waters, i.e. 0.2 and 0.05 mg/L, respectively (Regulation of the Minister of Health 2010). Fe distinctly predominated in wells W3, W6, W5 and W7 whereas Mn in wells W7, W5 and W2 (Table 4). In addition, the samples from wells W3, W6 and W7 exceeded allowable limits for SO4 2−, i.e. 250 mg/L (Table 5). The lowest concentrations of potentially toxic trace metals were found in well W8 located about 250 m northeast of the mining waste disposal site. Wells W7 and W3 exhibited the highest concentrations of U. These were much lower than U contents in seepage water of the former Ronneburg uranium mine (Eastern Thuringia, Germany) averaging 634 µg/L (Merten et al. 2004). Moreover, the levels of U in the Serwis well waters were within acceptable limits and did not exceed tolerable daily intake that yields a guideline value of 15 μg/L, based on the assumption that a 60 kg adult consumes about 2 L of drinking water per day (WHO 2004). The results of δ34S-SO4 2– and δ18O-SO4 2– determinations in the soils and waters examined as well as concentrations of dissolved SO4 2– are summarized in Table 5. The δ34S of SO4 2– extracted from soils were in the range of 1.6–2.7 ‰ with a mean of 2.3 ‰, whereas the δ18O-SO4 2– ranged from −5.6 to 2.9 ‰ with a mean of −1.7 ‰. For comparison, the δ34S-SO4 2– values of forest soils from the nearby control area varied from 4.8 to 5.8 ‰ with a mean of 5.4 ‰ (Migaszewski 1997). The δ34S-SO4 2– values of acid pool waters were similar varying from 0.3 to 3.1 ‰ with a mean of 1.3 ‰. However, the dissolved SO4 2– had the more negative δ18O from −5.5 to −3.9 ‰ (mean of −4.6 ‰). In contrast, the δ34S-SO4 2– values of farmer’s well waters varied from 0.7 to 7.2 ‰ with a mean of 4.1 ‰. The δ18O-SO4 2– of these wells showed distinct variations in the range of –2.6 to 8.0 ‰ (mean of 2.7 ‰). These isotopic extreme values may suggest variable redox conditions in the underground water circulation system. Two farmer’s wells W3 and W6 displayed nearly the same δ34S-SO4 2– values as the nearby acid pools P2/2, P2/3 and P2/4. Like these pools, W3 and W6 were also enriched in 16O isotope compared to the neighboring wells. These two wells lie in a shallow depression sloping somewhat from the north to the south. This landform feature favors acid water runoff draining the mine tailings pile. The surficial inflow of acid waters is also facilitated by a meridional pattern of farmer’s arable fields. Well W7, situated north of the mine tailings pile, has the δ34S-SO4 2– value (2.8 ‰) similar to that of acid pool P2/1 (3.1 ‰). Moreover, the δ18O-SO4 2– values of well W7 and P2/1 are also negative: –2.6 and –5.3 ‰, respectively. Both the δ34S isotope imprint and relatively high SO4 2– concentrations in the waters of wells W3, W6 and W7 (exceeding allowable limit for drinking waters) may point out to an influence of mine tailings pile. The distinctly higher δ34S-SO4 2– values (5.1–7.2 ‰) and δ18O-SO4 2– (1.5 to 8.0 ‰) with means of 6.2 ‰ and 5.1 ‰ were noted in wells W1, W2, W5 and W8. These values were also patterned by lower concentrations of dissolved SO4 2– in the range of 30–93 mg/L. Well 4 located close to well 3 stands out from the other wells by intermediate δ34S-SO4 2– and partly δ18O-SO4 2– values (4.0 and 3.6 ‰) and SO4 2– levels (181 mg/L). This may suggest some mixing of AMD effluents with perched aquifers. The δ18O-H2O values of acid pools and farmer’s wells were characteristic of the average values reported for rainwater from eastern Poland (−10.6 ‰) (Darling 2004), spring snowmelt from the Wiśniówka area near Kielce (−10.5 ‰) (Migaszewski et al. 2008) or recently-recharged aquifers in the Upper Silesia, southern Poland (≅–10.0 ‰) (Pluta and Zuber 1995). Variations in the δ18O-H2O and δD-H2O values combined with a high correlation coefficient (r 2 = 0.95) give information on diverse evaporation processes of the well water samples (Table 5). The results of cluster analysis are presented as site and element variable dendrograms for technogenic soil, acid pond and farmer’s water samples (Figs. 3, 4, 5). The dendrograms of selected trace elements for technogenic soils and acid pool waters reveal generally similar patterns that consist of three distinct clusters at (D link/D max) × 100 < 4, <12, <26 for soils and < 4, <14, <36 for pool waters (Fig. 3a, b). However, individual elements show various associations within these clusters. This is due to different mobility of these elements under a variety of geochemical environments, for example under oxidizing conditions with a pH of below 3, Ag, Ba, Cr and Pb are generally somewhat mobile, As, Fe, Mn and U are mobile whereas Cd, Co, Cu, Ni, Zn show even greater mobility. However, under oxidizing conditions with a pH of above 5 to circumneutral and the presence of abundant iron-rich colloids, some of these elements (Ag, As, Cu, Cr, Fe, Pb, U) are scarcely mobile to immobile (Smith and Huyck 1999). Of these elements, Ag, As, Co, Cr or U exhibits very different geochemical behavior occurring as unreactive anions or less mobile chemical species in reducing environments. The site dendrogram of farmer’s well waters generally shows the presence of two clusters: (1) wells W1, W8, W2 and W4 (<43) and (2) wells W3, W5, W6 and W7 (<53) (Fig. 4a). These cluster patterns coincide with diverse concentrations of SO4 2–, the lowest in wells W1, W8, W2 and W4 and the highest in wells W3, W5, W6 and W7. The statistically significant element variability at the linkage distance <43 may provide evidence for a greater influence of bedrock mineralogy and chemistry (Uzarowicz and Skiba 2011). The element dendrogram in turn reveals the presence of two clusters at (D link/D max) × 100 < 34 and <36 (Fig. 4b). These patterns are somewhat different from their equivalents for acid pool waters. It is interesting to compare site and element dendrograms of water samples derived from acid pools and four wells W3, W6, W7 and W5 that contain the highest contents of SO4 2– (Fig. 5a, b). The statistically significant site variability at the linkage distance <30 for these well water samples and acid pond water samples P2/1, P2/2 and P2/4 may provide evidence for a greater influence of the mine tailings pile examined (Fig. 5a). The element dendrogram displays the presence of two distinct clusters at (D link/D max) × 100 < 18 and <36 (Fig. 5b). This statistical similarity may also pattern the dominant influence of acid pool waters, which are generally characterized by similar spatial element distribution. As mentioned before, the concentrations of trace elements, but especially REE in the farmer’s well waters were very low. Although these elements are abundantly released from the mine tailings at a very low pH due to pyrite oxidation, this process also mobilizes a substantial amount of reduced Fe, which is subsequently re-oxidized as the pH returns to circumneutral values. This suggests that as opposed to SO4 2– ions, these elements are scavenged and immobilized through adsorption, co-precipitation, structural substitution by iron oxyhydroxides and clay minerals during infiltration of rainwater or meltwater to aquifers. Immobilization of trace elements and REE by mineral sorbents or organic matter was well documented in many case studies (e.g. Johannesson and Lyons 1995; Gimeno Serrano et al. 2000; Carlsson and Büchel 2005; Romero et al. 2010). In addition, the results derived from the study conducted by Merten et al. (2004) indicated that microorganisms and plants could actively absorb and take up trace elements and REE. As opposed to trace elements, REE seem to reveal lesser mobility in circumneutral waters and cannot be used as potential tracers for assessing an influence of the mine tailings pile on chemistry of the farmers’ well waters examined. In contrast, the technogenic soils, but especially the acid pool waters displayed high REE contents that enabled NASC-normalization of these elements (Figs. 6, 7) and evaluation of geochemical interactions between these two media. The mean and individual soil sample plots of NASC-normalized REE concentration patterns are characterized by the predominance of the MREE group (Sm through Ho) with distinct positive Gd and Sm and less positive Er excursions. In general, Eu, which separates Sm from Gd, displays a minor negative anomaly. All these patterns also exhibit a strong positive Ce anomaly (Fig. 6a–f). This element precipitates at oxidizing conditions in the form of Ce4+O2 (Dia et al. 2000; Leybourne et al. 2000). In contrast, distinct low Nd levels presumably reflect differential dissolution of an unknown mixture of accessory minerals and should not be called an “anomaly” because that suggests chemical fractionation, for which there is no conceivable mechanism. It should be emphasized that despite variations in the pH values (from 2.8 to 7.2) and REE concentrations (from 66.93 to 108.40 mg/kg), all the soil samples generally retain nearly the same NASC-normalized profiles with overlapping positive and negative anomalies. Even though the acid pools are also highlighted by somewhat asymmetrical roof-shaped MREE-rich patterns with the distinct predominance of positive Gd anomaly, they lack the Ce anomaly, which is so characteristic of the technogenic soils examined (Figs. 2, 3). This suggests that during weathering of pyrite-bearing mining waste material, the REE also undergo not only substantial remobilization, but also selective fractionation and a preferential release of heavy rare earth elements (HREE) into solution. Of the whole range of the REE examined, Gd appears to be more mobile being released more easily from the REE-bearing minerals to acid pools presumably in the form of sulfate complexes GdSO4 + and Gd(SO4) 2 − (Johannesson and Lyons 1995) and subordinate free metal cations Gd3+ (Leybourne et al. 2000; Fernández-Caliani et al. 2009). The study conducted by Fernández-Caliani et al. (2009) demonstrated that in the acid soil solution LnSO4 + made up 75–80 % of aqueous lanthanide species dominating over Ln3+ (12–16 %). Moreover, the shale-normalized MREE-rich patterns have been recorded in most AMD hydrologic systems throughout the world (e.g. Gimeno Serrano et al. 2000; Zhao et al. 2007; Fernández-Caliani et al. 2009; Welch et al. 2009). However, the distinct positive Gd anomaly is not common in the AMD waters, which typically show the positive Eu anomaly, for example, the REE profile from the Paradise Portal water, San Juan Mountain, Colorado (Verplanck et al. 2001). This also may suggest that Gd shows greater mobility as opposed to Eu and Sm in changing conditions of circumneutral and somewhat alkaline environments. This study has also shown that the REE form fractions that are more mobile at a lower pH, which is evidenced by distinctly steeper profiles in more acidic pools P1/1, P1/2, P2/1 and P2/2 compared to more flattened profiles in their less acidic equivalents P2/3 and P2/4 (Fig. 7b). At a higher pH, the labile REE are preferentially bound to precipitated iron oxyhydroxides. It should be stressed that both the soil and acid water patterns partly overlap revealing similar variations within the Tb–Lu segment with weak positive Dy, Er, Yb anomalies and somewhat negative Ho, Tm, Lu anomalies (Fig. 7a, b). This may suggest that in the study area these HREE behave conservatively in this soil–water environment. The results derived from two sampling series have indicated that the REE do not fractionate in the acid pool waters irrespective of time and sampling locations retaining the same NASC-normalized concentration pattern within the study area (Fig. 7b). The lack of dramatic seasonal variations in the distribution pattern of REE concentrations was also documented in other AMD waters showing a pH of below 5.1 (e.g. Verplanck et al. 2004; Merten et al. 2004). The stable S and O isotope ratios have found application in interpreting the mobility and fate of dissolved SO4 2– in and between various environmental compartments (e.g. Krouse and Grinenko 1991; Habicht and Canfield 1997; Seal II 2003; Mayer et al. 2004; Pellicori et al. 2005; Mayer 2006; Hoefs 2009; Miao et al. 2013). The principal source of SO4 2– ions in the acid pools is pyrite that occurs in the form of scattered grains and inclusions in dolomite. The Quaternary deposits underlying the mining waste disposal site do not contain lithogenic pyrite. The δ34S mean value of pyrite is 3.2 ‰ (n = 8) and is close to that (2.3 ‰) of SO4 2– extracted from soils. This is in accordance with the results of other studies that the δ34S of dissolved SO4 2– should be identical to parent sulfide minerals under quantitative disequilibrium oxidation (e.g. Taylor and Wheeler 1994; Migaszewski et al. 2008). These results suggest that pyrite contained in the mine tailings is the only potential source of dissolved SO4 2– in the acid pool waters. Pyrite also appears to be a dominating source of dissolved SO4 2– for the local underground water system. The other sources including atmospheric sulfur deposition, sewage, fertilizers (ammonium sulfate and superphosphates) and manure may only slightly modify the δ34S signatures of well waters. The recent studies conducted in the Holy Cross Mountains indicated that the atmospheric input of sulfur could be negligible as a potential source of SO4 2– (Migaszewski et al. 2008; Michalik and Migaszewski 2012). The concentrations of SO4 2– in rainwater and snowpack locally exceeded 2.5 mg/L with a δ34S signature close to the range of 5.1–9.2 ‰ (Migaszewski et al. 2008; Michalik and Migaszewski 2012). This δ34S signature is similar to that (1.2–6.2 ‰) noted in rain water of the neighboring Lublin province, eastern Poland (Trembaczowski 1989). Analogically, the inorganic fertilizers should be excluded from consideration because they are not commonly used in the area around the mine tailings pile. Besides, in Europe they have distinctly positive δ34S and δ18O values (Szynkiewicz et al. 2011). Otero et al. (2008) reported the δ34S = 5 ‰ and δ18O = 12 ‰ for fertilizers, and the δ34S = 9.6 ‰ and the δ18O = 10 ‰ for sewage. Two dominant transformation processes may influence concentrations and isotopic imprint of dissolved SO4 2– in the AMD water systems. They include (1) oxidation of pyrite and other iron-bearing sulfides and (2) anaerobic bacterial (dissimilatory) sulfate reduction (BSR) (e.g. Knöller et al. 2004; Brunner et al. 2005; Mayer 2006). The other potential process that encompasses mineralization of carbon-bonded sulfur compounds (CS-mineralization) plays a significant role in organic soils or forest ecosystems (e.g. Mayer et al. 2004; Mayer 2006). However, the technogenic soils of the study area contain only a small amount of total organic carbon (TOC) varying from 0.1 to 2.5 % (Uzarowicz 2011). This evidence suggests that CS-mineralization does not affect much the isotopic signature of dissolved SO4 2– in the acid pool and farmers’ well waters. The δ34S-SO4 2– vs. δ18O-SO4 2– plot of the soil and water samples examined is depicted in Fig. 8. This displays the isotopic ranges for two basic transformation processes: (1) pyrite oxidation and (2) BSR. The former prevails in the acid pool waters whereas the latter in the farmers’ well waters. The most advanced BSR process is documented in wells W4, W1, W8, W2 and W5 by a distinct shift toward more positive δ34S-SO4 2– and δ18O-SO4 2– values (e.g. Strebel et al. 1990; Habicht and Canfield 1997; Mayer et al. 2004; Edraki et al. 2005; Mayer 2006). In contrast, wells W6, W3 and W7 are highlighted by less positive δ34S-SO4 2– and δ18O-SO4 2– values. This suggests a greater influence of more oxidized acid pool waters, which is also evidenced by the highest concentrations of dissolved SO4 2– (Table 5). The δ34S-SO4 2– and δ18O-SO4 2– vs. SO4 2– concentration plots (Fig. 9) provide more information on the origin and transformation processes of dissolved SO4 2–. In general, the farmers’ well waters show a decrease of SO4 2– concentrations with enrichment in 34S and 18O, which may give the evidence for the predominance of BSR process. This is also supported by the correlation coefficients (r 2) = 0.80 and 0.41, respectively. Assuming that enrichment factors εair and εwater are –11.2 ‰ and +4.1 ‰, respectively (Van Everingden and Krouse 1985), a δ18Oair for atmospheric oxygen is +23.5 ‰ (Kroopnick and Craig 1972), and a δ18O for ambient waters varied from –12.4 to –9.0 ‰ (Table 5), about 90–99 % of sulfate oxygen is derived from water during formation of dissolved SO4 2– in acid pools. This indicates that anaerobic pyrite oxidation plays a decisive role in this environment (if the sampled water was the same water that was present during SO4 2– formation). However, Balci et al. (2007) indicated that Fe3+ was the principal oxidant of pyrite at the pH of below 3, even in the presence of dissolved oxygen. Moreover, these authors also provided evidence showing that sulfate oxygen may come from water under both aerobic and anaerobic conditions, which occur in the acid pools examined. Technogenic soils represent a highly heterogeneous material, which is evidenced by substantial spatial variations in concentrations of most elements (especially Co, Fe, Mn, Ni, Pb, S, U, Zn). As opposed to farmers’ wells, acid tailings pool waters showed exceptionally high REE contents. Moreover, the NASC-normalized REE profiles of these waters were featured by the predominance of MREE with a strong positive Gd anomaly (scarcely found in the AMD waters). It is noteworthy that the roof-shaped REE pattern remained unchanged during two measurement series irrespective of sampling locations (and pH). The influence of the mine tailings pile on farmers’ well waters may be evidenced by SO4 2– ions that occur in excessive amounts in wells W3, W6, W7 and W5. This conclusion is also inferred from similar δ34S-SO4 2– signatures and a site variable dendrogram that groups these four wells into one cluster linked to the acid tailings pools. The δ34S-SO4 2– and δ18O-SO4 2– values indicate that the BSR process generally dominates in the underground water circulation system charging the farmers’ wells. The isotopic data also point out to the oxidation of pyrite induced by more effective ferric ion (iron oxidation path). Considering this, the reclaimed mine tailings pile at Serwis jeopardizes the local underground water system. The results derived from this study also indicate that the acid pools should be protected against accidental surficial runoff or leachate by constructing earth barriers. Moreover, this site needs periodical monitoring to evaluate its impact on the neighboring environment. The authors would like to thank Dr. Łukasz Uzarowicz for his valuable remarks and suggestions regarding the study area. This study was supported by the National Science Center, a research grant (decision # DEC-2011/03/B/ST10/06328).